Written by Pat Hughes, C3’s associate in nursing, health and development. I was delighted to accept, on behalf of C3 Collaborating for Health, the Sigma Theta Tau International (STTI) Archon Award at their 44th Biennial Convention in Indianapolis on 30 October 2017. 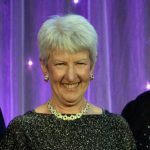 STTI is the largest and most prestigious Honor Society of Nursing in the world and the Archon Award is one of the most distinguished awards they confer. The name “Archon” is derived from the Greek word meaning “first to lead”. The awards are bestowed by STTI’s board of directors on individuals and organisations who have shown exceptional leadership in advancing the health and welfare of people throughout the world. The award was presented at the Founders Dinner, an inspiring and glamorous occasion which could easily be described as the Oscars of Nursing. Dinner guests included leaders and luminaries from across the world of nursing and global health. This was definitely a big honour. As the first recipient of an award that evening it was particularly humbling and somewhat daunting as I approached the stage to hear the names of previous recipients being read out. These included His Highness the Aga Khan, Save the Children, Her Royal Highness Princess Muna Al Hussein as well as Dr. Jonas Salk, Sir George Alleyne and Dame Cicely Saunders. C3’s nursing associate, Pat Hughes, with Cathy Catrambone, STTI President and Patricia Thompson, STTI CEO. There are many renowned and acknowledged nurse leaders across the world who know that prevention of non-communicable disease (NCD) is an urgent global challenge and that nurses have a key role to play. However, C3’s founder and director, Christine Hancock, recognised that prevention is everybody’s business and that most key players operate outside of the health system. In establishing C3, Christine recognised the importance of multi-sectoral collaboration and also identified opportunities to engage with and galvanise the world’s 20 million nurses, drawing on her experience as a clinician, CEO in the NHS, CEO of the Royal College of Nursing, president of the International Council of Nurses, and economist from the London School of Economics. Since its inception in 2009, C3 Collaborating for Health has partnered with over fifty organisations. We are unusual in our ability to align public health needs with businesses’, communities’ and individuals’ needs so that interventions and programmes are sustainable and beneficial to all of society. We have delivered strategy consulting for foundations (e.g. the Health Foundation); charities (e.g. DiabetesUK); and businesses (e.g. Novo Nordisk, Nestlé and People Plus). This consulting informs their strategic priorities and projects, which then benefit their employees, customers, communities and beneficiaries. We have worked with health professionals, including those representing the Uganda diaspora nursing community, NHS staff, nursing students and obese nurses in the UK. We have also worked directly with over 6,000 individual community members (e.g., mums and children, elderly, young people) from 8 disadvantaged London communities and in Halifax and Girvan to identify initiatives that can make it easier for them to access healthy food or physical activity options. Using an innovative m-health tool called CHESS™, we’ve helped these communities raise over £2 million to fund their proposed health initiatives. STTI was founded by six nurses in Indiana in 1922 to advance world health and celebrate nursing excellence in scholarship, leadership and service and now has 135,000 members in more than 90 countries in 500 Chapters. C3 started small and is known to ‘punch well above our weight’ – who knows what we might yet achieve? The STTI led Global Advisory Panel on the Future of Nursing and Midwifery identified NCDs as the top global health priority within the context of the Sustainable Development Goals and Universal Health Coverage. A sustainable, healthy, nursing workforce is an essential pre-requisite, hence C3’s ongoing work to promote and support nurses’ own health through the emerging Healthy Nursing Collaborative. C3 acknowledges that our work with nurses and our global recognition for this work would not have been possible without the generous support and commitment of the Burdett Trust for Nursing. Read more about C3’s work on our projects page. Pat Hughes is associate in nursing, health and development at C3 Collaborating for Health.